Traveling – that is the dream. Any way I can. If not by RV, then some other way. Certain events this week have conspired to force me to change my plans. 1. my vehicle is on its last wheels. I’ve been told I need a new engine. not surprising since the car is 14 years old. I just didn’t think it would die so soon. 2. My legs are in need of treatment. It’s been getting hard for me to walk. I thought it was just arthritis but the nerves in my legs are numb and I run out of breath easily. Hitching and unhitching the RV is difficult. I don’t know what the outcome will be. Maybe park the RV in a all-year campground and travel by car. Maybe sell the RV and stay with my daughter when I’m in town between travels. Maybe live in residential motels and airBnB apartments while traveling. I need to figure this all out, so this blog may go dark for a while. I’ll keep in touch via FB and email. I’m on my way back to Fort Wayne so no pictures, just a quick stopover at Mohican State Park in Ohio. Lots of places around here use Mohican in their name. Does the Mohican tribe live around here? I thought they were in New England. Will be at Johnny Appleseed Campground in Fort Wayne starting tomorrow night until after the wedding. Today was a good day. I woke up in time to see the sunrise. Had my coffee outside at the picnic table. Took a walk up to the ranger station to add a day to my stay. I don’t want to drive today so I’ll just stay here and rest. There’s all kinds of interesting amenities at State parks. Like this exercise area. Found a trail through woods – my favorite thing to do. Another perk of the parks system is the way they try to ensure walkers are comfortable traipsing though the forest. Made myself a nice lunch of chicken and pasta. And then went for another walk. I think hiking will not be a priority for me anytime soon. My legs began to feel pain after about 20 minutes. So home again to lay down. Watched a movie on my portable DVD player since I do not have a TV. I do have a built in antenna so I may re-think this. I have a hot spot for Wi-Fi but video eats up data really fast so I try not to watch movies or even you tube on the internet. I now consider Red Box one of the greatest inventions of the decade. I actually thought about writing a little, but not feeling particularly ambitious, I read a book instead. Outside in my camp chair. With the exterior lights on. And a cool breeze made it perfect. Got on the road by 9:00a.m. Decided take State Road 6 which meanders along Lake Erie. The route goes through small lake towns right on the edge of the water. I stopped a couple of times and observed small town idiosyncrasies. A food mart that has a rule for using credit or debit: You must purchase at least $4.00 or else pay an extra fee. And a Subway that had a sign saying the restrooms were for paying customers only. Well I had to pee so I tried a breakfast sub. Not bad. Getting closer to Cleveland, there was a distinct separation on either side of the road. The houses on the lake side were big, with long front lawns and circle drives. And on the other side they were small and nondescript. I did think it was funny that many on the lake side were up for sale. I thought I would escape the city, but alas, Route 6 went right through downtown. I had no problem navigating the streets, although all the turns were tricky to catch. But then, just as it got more residential, the road was closed! So I had to go off into some neighborhoods, wandering around side streets, praying that I wouldn’t side swipe a car. Got through that and found State Road 20. Then, my first disaster. I stopped to get gas and rammed a pump. Loosened the fender and knocked the steps off center. I now cannot get the steps down. Crap!!! I think I’ll buy a small 2-step up until I can decide where to go to get them fixed. Cross your fingers that that’s the only damage I ever do! Back on the road, I stopped off at the rest stop to get my bearings. 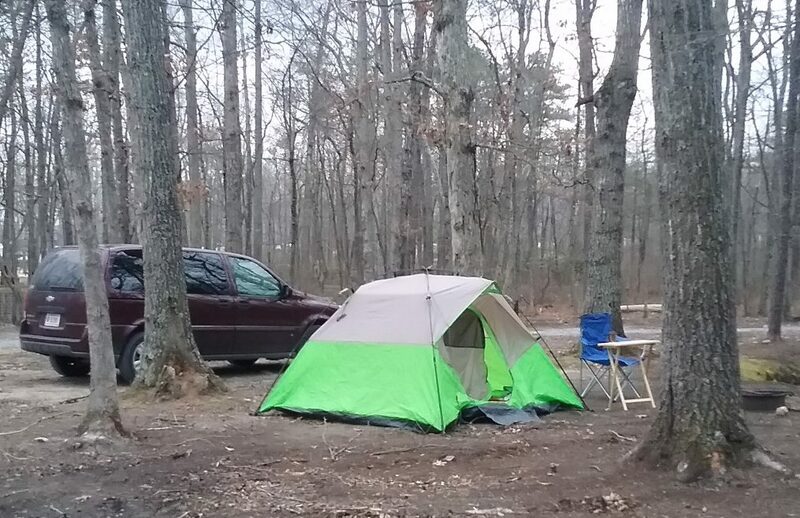 I had discovered this morning that the State Forest I wanted to go to did not allow RV’s, only campers. So I stopped here at Pymatuning State Park in Pennsylvania. Very nice. After all that happened today, I am exhausted. So now I will watch a movie and get some rest. I’m sitting in East Harbor State Park just north of Sandusky, Ohio, after a full day of controlled chaos and exhaustive driving. This morning I learned how to hitch the trailer to the car. With the help of two wonderful ladies at Blue Lake Campground, we got it done in just under an hour and half. The reason it took so long was that they didn’t know everything either. And we had to put the swing bars on, find the right fasteners, get a wrench, and jerry rig a way to secure the LP gas cover. But now I am set to go it alone. I left out and headed east. Stopped and had lunch. Navigated 3 different road construction sites. Got off the highway to get gas. And I drove really carefully. Slow and steady. So even though it was only about 150 miles, it took me almost four hours. The first hour was a bit nerve-wracking, but then I settled in and started enjoying the drive. Every time I stopped I debated on where I was going to end up. And finally decided on this campground. It’s actually on Lake Erie, but the park is so big that the campground is on the opposite side of it from the lake. So I can’t see it. However, the camp sits on the edge of Sandusky Bay so I did get some nice pictures. Tomorrow I will try to stay along Lake Erie on my way to New York State. I’ve got my eye on a National Forest where I can boondock. About what happened when I went to pick up my rig. Oh great I’m thinking, a problem already and I haven’t even hitched it up yet. Wait a minute, he meant it literally. The hitch on my car is too small for an RV! So I did not know that there were different sizes. The car had one, I thought I was good. Apparently not. Just the first thing in what will probably turn out to be many things I do not know. So, the good people of Camping World told me I needed to buy a new hitch. They could go ahead and order it for me, it would be there the next day when UPS delivered, and they would install it. It would just take a couple of hours. OK. And for another fee, they would deliver the trailer to the campground for me. Well, I was a little leary of backing it up anyway, so I said yes. I drove away to get to get some lunch and think about the situation. I really did not want to drive back to Fort Wayne (a 2 hour trip) and then drive back down to Indy the next day. So I got a motel room. There was a Red Roof Inn conveniently sitting just across the road from Camping World. I called the campground where I had a reservation and they were really great about changing the dates. No problem there. The next day, I went over and waited for UPS. You know how people say it should be here anytime between ten and two? Yeah, I didn’t believe it either. It finally got there around 3:30 and they took my car. Salesman Dan explained that since there wasn’t enough time to complete the work that day, they’d have it ready in the morning. So when I asked if he could run me over to the Red Roof, he was surprised. Turns out, I could stay in my RV right there on the lot, with an electric hook up! For Free! He said he wished he had known I went to a motel, I could have saved myself the money. So he set me up in the RV, with A/C, brought me water and Gatorade, and then… came back with a gift card since I had been through a lot of trouble. $100 for anything in the Camping World store. But wait…there’s more! He asked If I had food. I didn’t, so he offered to run down the street to White Castle and bring me some sliders and fries. Paid for by him. Well a girl doesn’t get that kind of offer every day, so yeah! Dan S at Camping World Indianapolis – you are an angel! The next day, Thursday, brought ANOTHER problem. The old hitch was so old and some of the screws or bolts or something were broken off, so they would need to do some welding or something. Car mechanic stuff. So it was going to be another couple of hours. Geesh! But I am so glad they were delivering the rig. By now I was really frustrated. Dealing with learning how to back into a spot after all this was not high on my list of things I want to do. I actually got on the road by 1:30. The campground caIled wondering if I was OK and where was I? I stopped for a bathroom break and to let them know I was on the way. Got here around 4:30. Next up – learning how to hitch the RV to the car. Whoopee. That’s what Bilbo Baggins said as he started out on his journey in The Hobbit. And that’s exactly how I feel today. I picked up my RV yesterday. It’s a 2016 Coleman Lantern, 25 feet, sleeps 4. I bought it at Camping World of Indianapolis last week. They did some prep work for me, i.e. hook up the electricity and water, fill the propane, etc. I also bought a hitch from them that they installed on my car. Great service. I received a complimentary 3 year membership to their club affiliate – the Good Sam Club. It gives me all kinds of discounts on campgrounds, gas, insurance, medical, and shopping at their stores plus interest groups I can join, rallys and an online site with forums and all kinds of information. I’m going to camp at Blue Lake Campground just north of Churubusco for a week. So I can get settled in to living in an RV. It’s close to home (I still have a lot to do in closing up the apartment), and to a Coleman dealer if I run into any problems. I will be running back and forth from the apartment to the campground for a while. And then I will head northeast for a couple of short trips. I need to come back in October to attend a wedding. And then, who knows?